The following collection of diagrams and descriptions is intended to assist organizations and community groups prepare for an event that hosts the Lieutenant Governor. 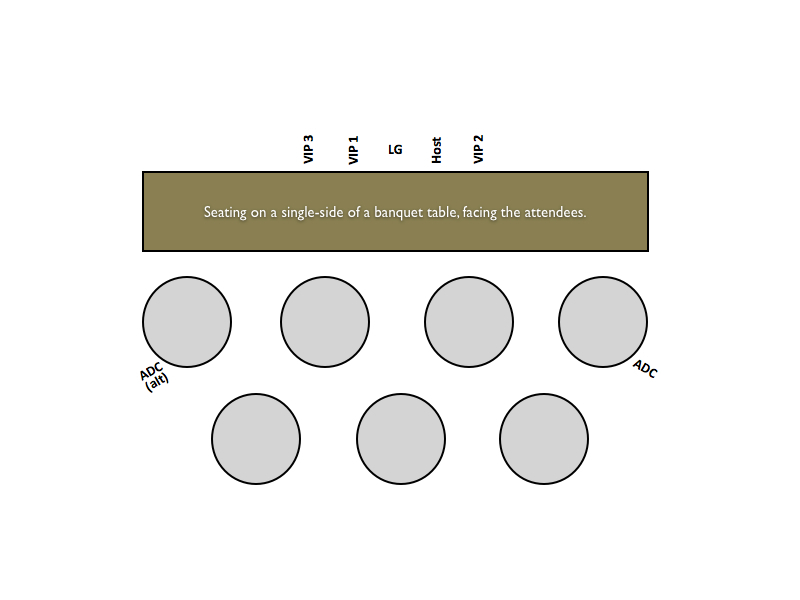 When an event features multiple tables and no stage, the preference is for the Lieutenant Governor (LG) to be seated facing the majority of the attendees. The Lieutenant Governor is seated to the right of the host. The Aide de Camp (ADC) should be seated in a position with an unobstructed view plane to the Lieutenant Governor. 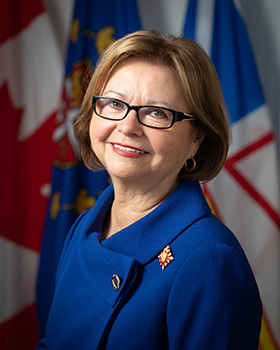 When attending as a guest at a social occasion involving a stage and numerous tables of guests, the Lieutenant Governor is normally seated in the centre of the front row of tables facing the stage. The host is seated to the left of the Lieutenant Governor. The next senior VIP is seated to the Lieutenant Governor’s right. The ADC is seated in a location providing an unobstructed view plane to the Lieutenant Governor. At a rectangular banquet table with additional satellite tables, the Lieutenant Governor is seated in the centre of the table and to the right of the host. If additional guests are seated at a banquet table, including seating opposite to the Lieutenant Governor, the order of precedence for seating after the host and the Lieutenant Governor is that the next senior VIP is seated opposite the Lieutenant Governor. The ADC is normally seated at either end of the table on an opposing side to Lieutenant Governor. At military dinners the President of the Mess Committee (PMC) is normally seated to the right of the Head Table. The Lieutenant Governor is seated at the centre of the table, to the right of the host. 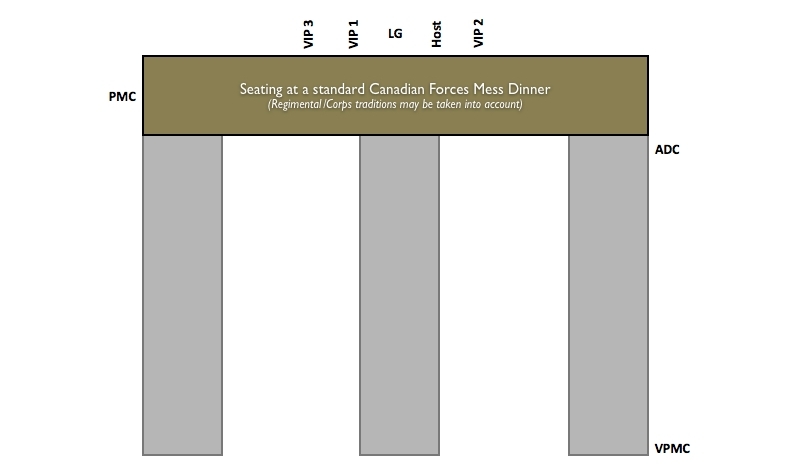 The ADC should have a seat at an exterior wing of the dinner with a clear view plane to both the Lieutenant Governor and the PMC. 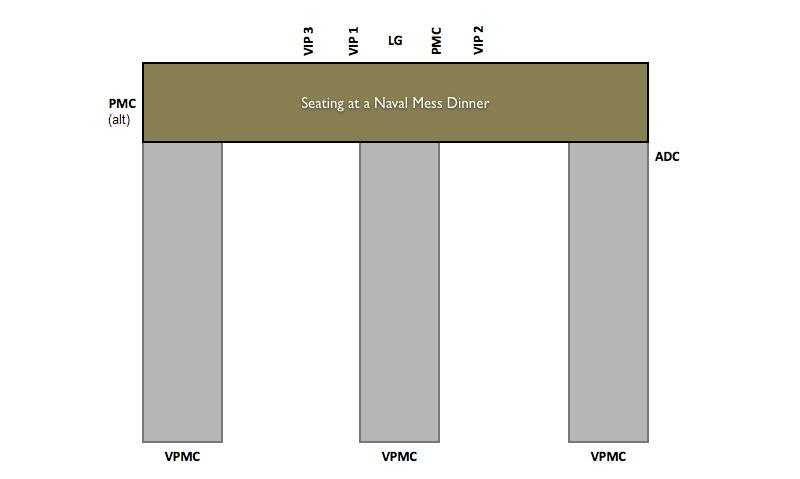 At naval mess dinners, the PMC is located at the Head Table. 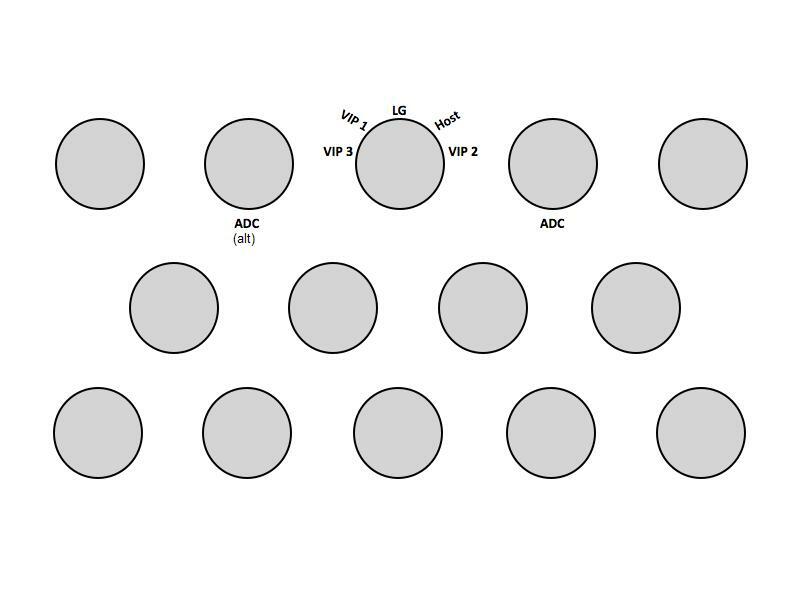 The Lieutenant Governor may be seated either centered at the Head Table or to the right of the PMC if the PMC is seated center. When seated at an event being presented on a stage, but not involving acoustic considerations, the Lieutenant Governor should be seated to the right of the host and as close to centre of the front row of the audience as possible. 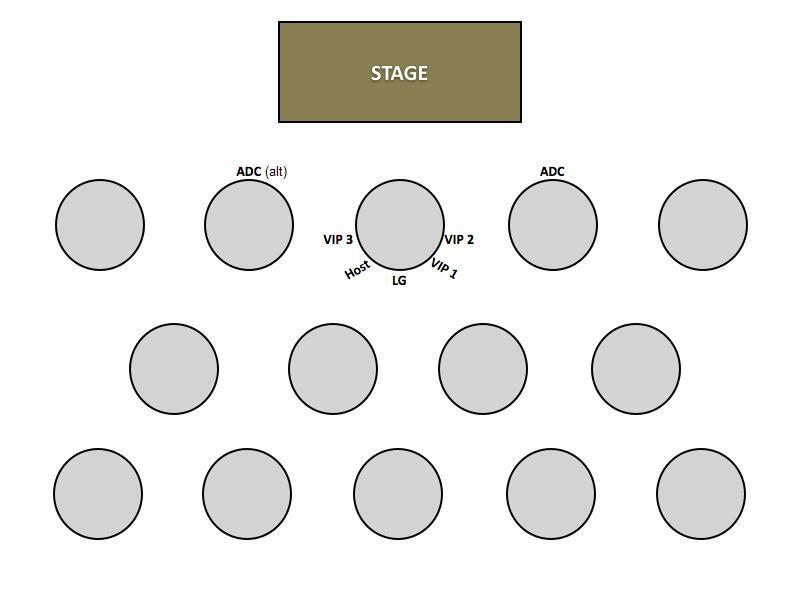 If an aisle of ingress and egress is provided, then the right-most seat of the left front row should be reserved for The Lieutenant Governor. The ADC will normally be seated directly behind the Lieutenant Governor. 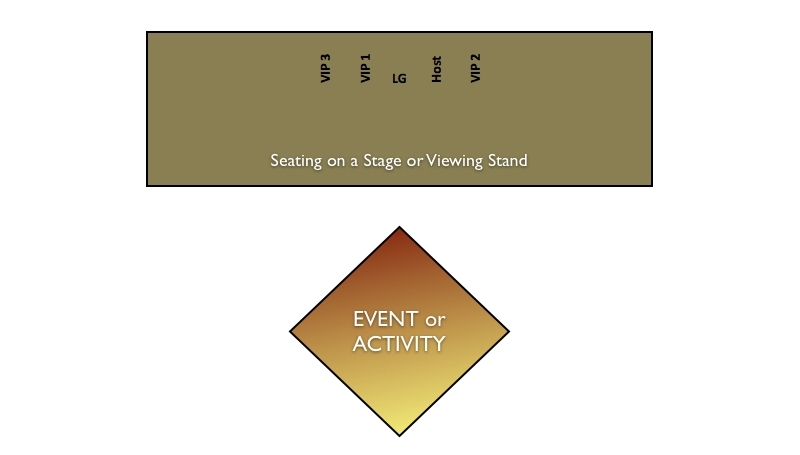 Alternatively, the host can sit at the aisle-seat of the right section of the audience. In this case, the Lieutenant Governor is seated one space in. However, in such cases the ADC will need to sit behind The Lieutenant Governor but the aisle seat will be required to be left unoccupied. 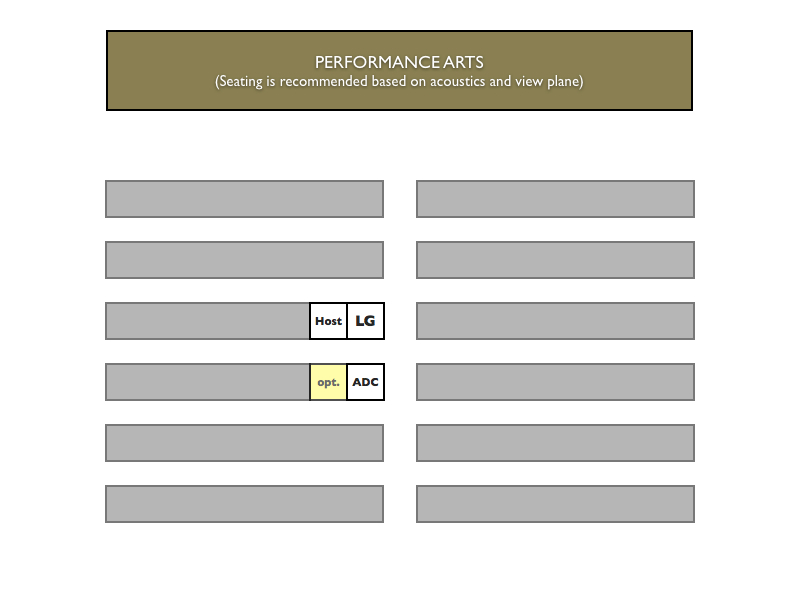 At artistic performances and in acoustic spaces, it is recommended that the Lieutenant Governor be seated in a location to afford the most unobstructed and acoustically central position. As with other auditorium seating, the ADC will sit behind the Lieutenant Governor. When seated on a viewing stand, or stage, and observing an event or activity (such as a parade) the Lieutenant Governor is seated at the center of the stage and to the right of the host. Additional VIPs are seated to the left and right of host and the Lieutenant Governor. The ADC will normally be seated to the left or right of the viewing stand unless there is sufficient space to allow for seating in a row behind the dignitaries.